My eyes welled with tears as we sang the precious words. I felt to so close to that place, being here in Jerusalem, and I envisioned Gordon’s Calvary or Gan HaKever in Hebrew, not too far from us. What a joy to be so close to place where Jesus was crucified and buried–where just blood was unjustly spilled. 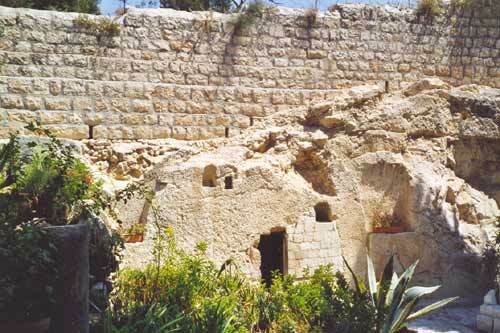 It is one of two places that seem very close to the historical account of where Jesus or Yeshua was taken and laid in His grave. The Church of the Holy Sepulchure is the other. Both attracts thousands of seekers and pilgrims each year. It is a beautiful garden today with ancient sepulchures, ancient winepress, trees, and lots of flowers. Every time I go there, the Holy Spirit meets me and hovers so close, and I leave changed — something deepened in me by reaching out to Him to contemplate His magnificent gift to mankind. In reality, maybe this is the place and maybe it is not; but its beauty and peace allow the mind to focus and pray — to meditate and soak in the personal reality of His death, burial, and resurrection. May Jewish people around the world see Yeshua as the long-awaited Messiah who was pierced, buried, and risen on the third day.